I remember the first time I saw Big Mike’s BBQ. The food truck was easy to spot since its a big red barn. 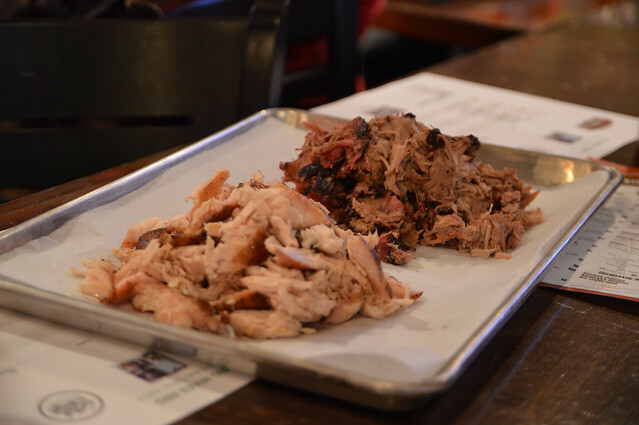 While BBQ cuisine is usually an easy ordering decision, Big Mike’s is not. 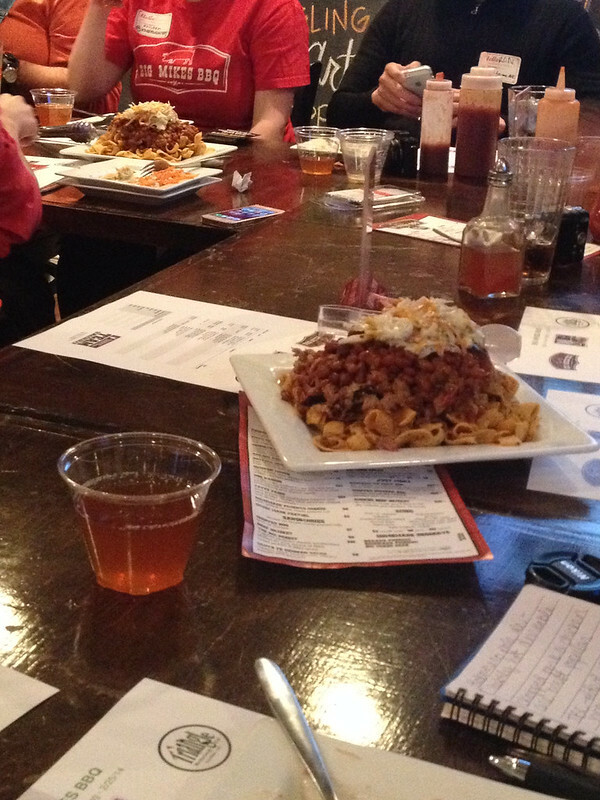 The first menu items were Redneck Nachos and Piggy Mac. It gets you thinking: this ain’t your daddy’s or granddaddy’s BBQ. The time I can remember them recently was when they parked at the Wednesday’s rodeos at 4800 Fall of Neuse. I remember looking at that menu and paused in awe. I hadn’t had Mac & Cheese in awhile, so I took a chance on the Piggy Mac. The Piggy Mac seems like a simple menu item: Mac & Cheese, Pork, and sprinkled with Salt & Vinegar chips. However, the simplicity is overwhelmed when all those flavors entered your mouth. For those that enjoy Eastern NC, you will enjoy the chips mixed in with the meat and cheese. I had that dish on my mind for awhile. The bar at View Bar. 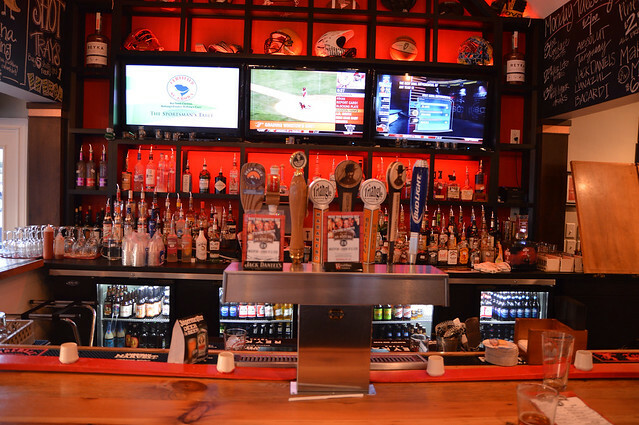 Notice 6 of the 8 taps are local. Before Mike wows you with the recipe inventions, it was apropos to start with just meat on a plate. The meat was moist and tender, which could be eaten as is. However, I like to get crazy stupid. So I poured a little pool of Crazy Stupid sauce to dip the meats in. Other sauces were a smoky Western North Carolina sauce, which was great for double dipping with the “hotter” sauces, an vinegar-based Eastern North Carolina sauce (good starter for the NC newbie), and a hot sauce that reminded me of a Frank’s/Texas Pete like sauce. Because of the vinegar in that sauce, I thought the hot was hotter than the Crazy Stupid sauce. My first run in with BBQ and Nachos were at Carolina Hurricanes game. The cart would start with tortilla chips as a base, pile on some Pork, and let the nacho cheese rundown like cheesy lava. Take that perception and toss it. Mike’s version scraps that idea from the beginning. First he starts with Fritos, then adds the pork, then some sweet baked beans, blue cheese, coleslaw, and tops it with sweet hot mustard sauce. Eating these with your hands means you are going to get messy. For those that like to keep clean, thanks to small size of the corn chips you can use a fork, if you must. These are something I would order, especially if you have a decent sized group. They are easy to share, and the sweet flavors are so good. Fans of the truck will recognize this Greatest Hit. However, thanks to the new location a new step can be added, a flash fry. 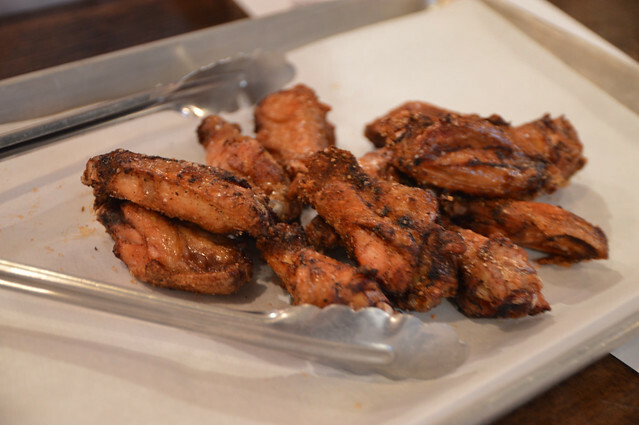 This process keeps that smoked process inside and gives the wings a nice crispy texture. And if that doesn’t heat your buds, the dry rub on the wings will tingle your tongue, your lips, and anything in your mouth’s vicinity. My wife is from Texas and she is very critical about brisket. I have heard many comments that people try to come close to Texas, but she has always come back disappointed. One other food truck, The Humble Pig, has gotten her approval. However, I think she needs to try Big Mike’s. When I eat brisket, I don’t like it to be tough. This is a feature that has gotten my disapproval elsewhere. At Big Mike’s at first bite, I feel the meat exploded in my mouth with flavor. Another sign that the brisket is cooked well, it does not need sauce. 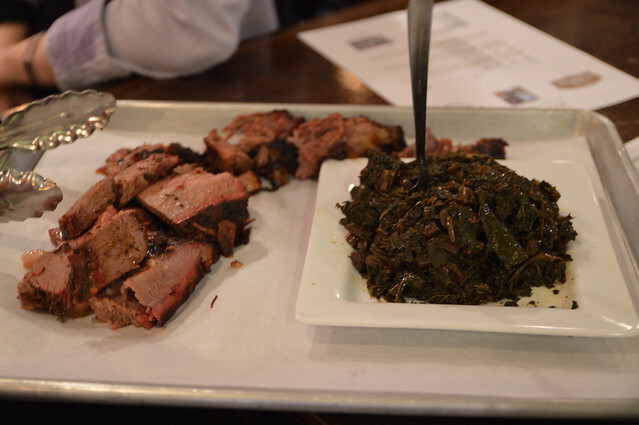 Brisket fans, I think you need to make a stop here and judge for yourself. 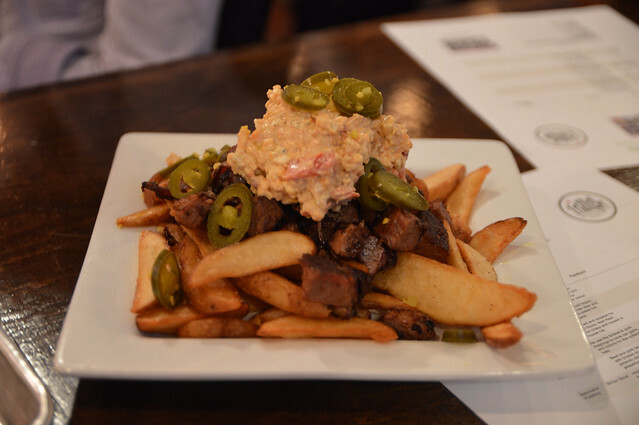 These steak-cut fries, layered with brisket, pimento cheese, and jalapenos is an interesting remix of the covered fries pub-fare. I liked scooping up the ingredients and dipping them plain in the pimento cheese. Either way, this is another great share plate. One thing locals like is Banana Pudding. And most have some sort of yard stick to measure this against. I grew up elsewhere, so I can try these without that measurement. 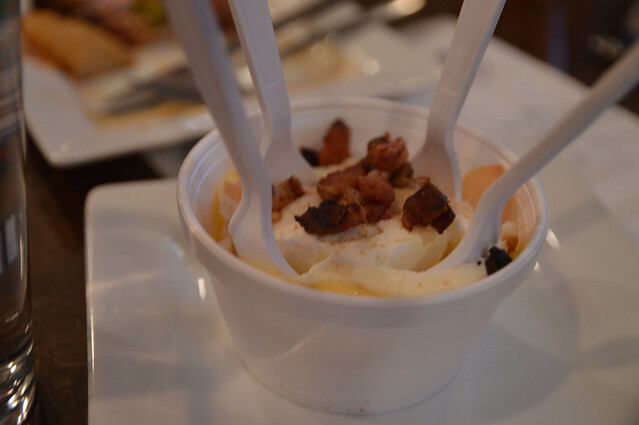 I really enjoyed the banana pudding, where you can really appreciate homemade preparation. The bacon seemed a little much (now I have ruffled feathers, I questioned bacon), but it was still good together. You can order this dessert with or without bacon on the menu. 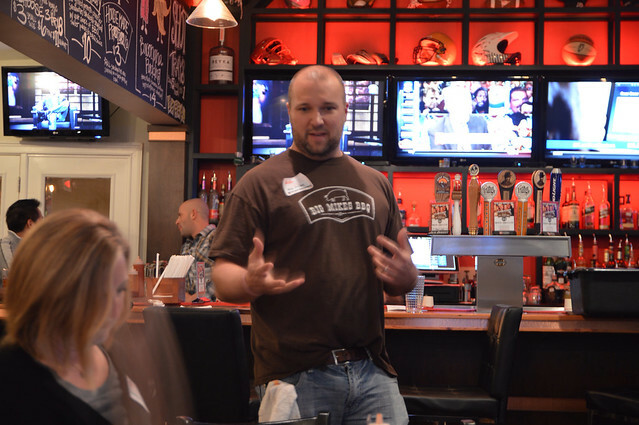 On hand at the BBQ tasting was Doc from Triangle Brewing Company. 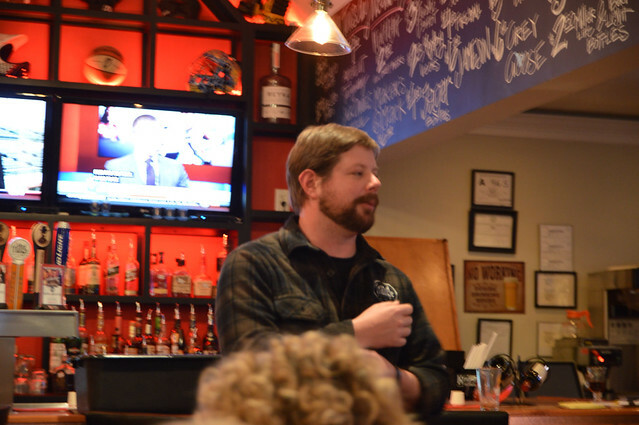 He introduced each of the beers, some had real detailed stories, and went over some of the tasting notes we were feeling. 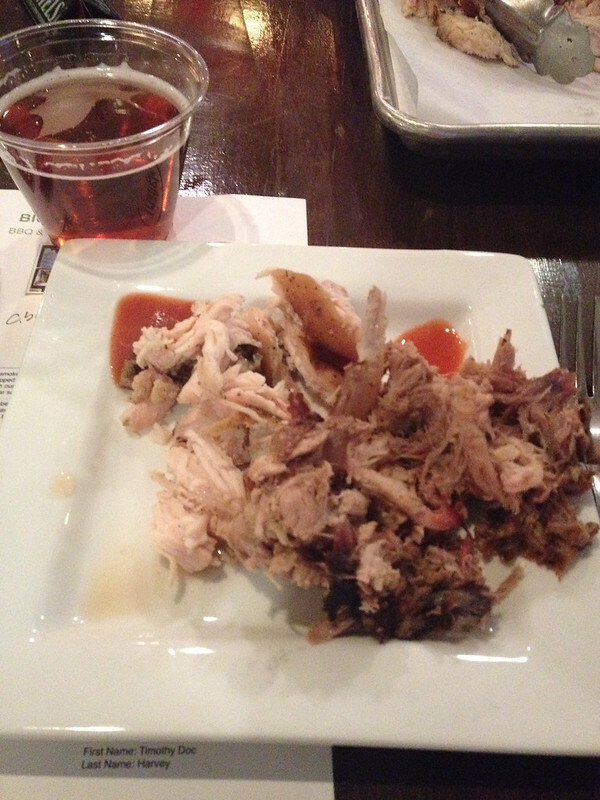 The Chopped Pork and Chicken (1st course) was paired with their Habanero Pale Ale. This was also given before the food. At first, I thought I was catching a cold as the back of my throat had this tinge. After realizing Habaneros were in the brewing process, the idea of reaching for Zicam was subsided. I enjoy spice and when paired with the meats singularly, it seemed to go really well. The Redneck Nachos (2nd course) was paired with the Lambic. From what I was told, this would be similar to a Framboise (raspberry-flavored beer) in style. Though this beer in particular was more Peach, maybe a nectarine, which made sense looking at the color. 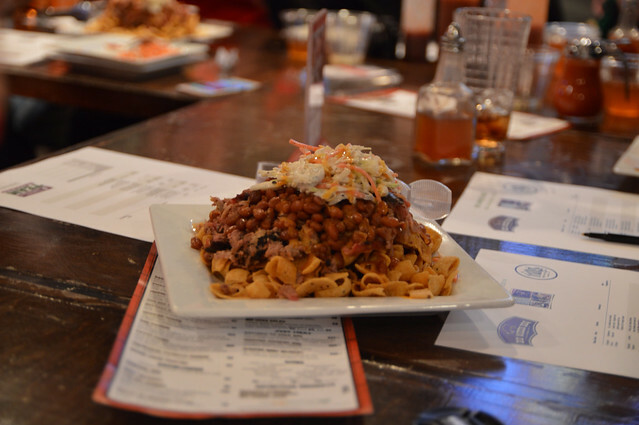 It made sense because the cole slaw and beans were sweet on the nachos, further promoting sweetness. The Smoked Wings (3rd course) introduced a classic (in my mind) of Triangle’s work, Belgian White. For those who had not tasted Triangle’s work, but enjoy Blue Moon, I would suggest this beer. You really taste the coriander and orange peel here. With the spices fried on the wings and the citrusy beer, this is a beer-food love connection. 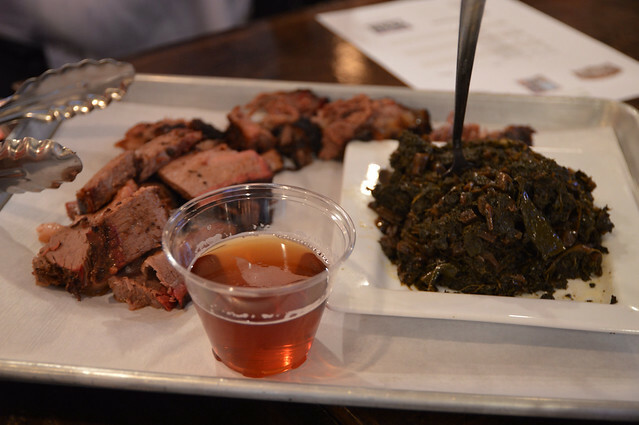 The Beef Brisket w/ Collards (4th course) was paired with their seasonal, Belgian Abbey. My notes have “disappeared” on this one. However, I went back and looked at Triangle’s website for some “reminders”. I do remember it being good, but I could have also been distracted by the brisket. I am sure the collards help pair this based on the site’s notations with sushi and seaweed. The Fatty Fries (5th course) was paired with a beer I am not typically a fan of, India Pale Ale (IPA). Though I wonder if the factors of: this is my 5th+ beer, the wide variety served, or the possibility that the aluminum can changed my taste perception. I enjoyed this beer and pairing, especially since the fries seem to tame the hoppy aftertaste. Lastly, the Baconana Pudding (6th course) was paired with Winter Stout. The coffee and chocolate notes seemed to be an easy match for the homemade Banana Pudding. When it comes to food and beverage pairing, my first answer is always pair your favorite food with your favorite drink. That will always be a perfect pairing. However, its always nice when you get the food and drink to team-up and tag team on your taste buds. 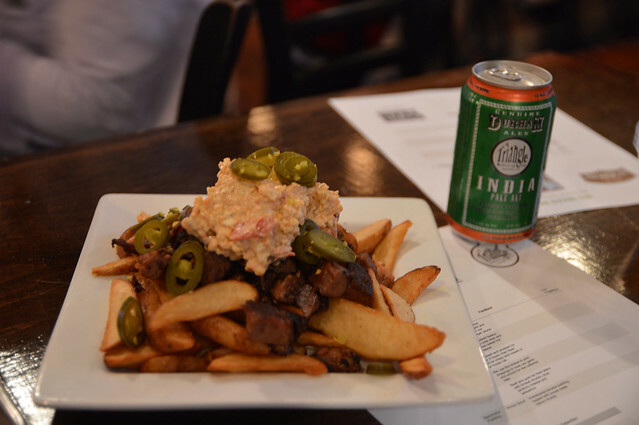 Triangle Brewing’s beers with Big Mike’s BBQ could easily contend for Tag Team champions on your taste buds. Revisit: I returned a few days later to get a feel for lunch. Seems like Big Mike’s restaurant is not a secret and I saw a packed Friday lunch! A friend had the The Big Cheesy on truck, so I decided to give it a try. 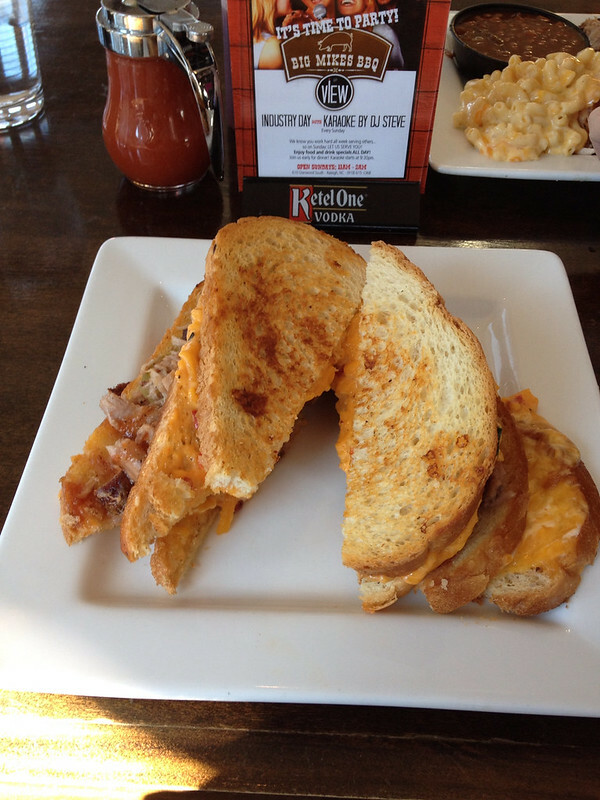 I have a big mouth, so I could easily eat two grilled cheese sandwiches with pork and pickles in the middle. However, I could see others struggle. Though I would still order this, because it is GOOD! I always like to see everyone’s perspectives on these. Bottom line: It’s a good restaurant. Food was so good. 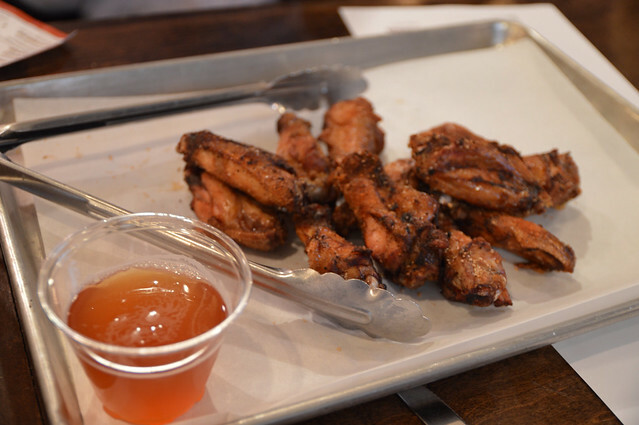 I’m definitely planning to go back for more of those crispy wings!